Ƿōden is nama ānes þāra Þēodiscum goda, hƿæs nama is of Mercurie on Englisce āreaht, for þǣm þe hē is þæt nīehste god tō Ƿōdne. His nama is oft gefunden in cynnreccennessum Engliscra cynelicra mǣgscīra. His dǣl ƿæs manigfeald; hē ƿæs god ƿīsdōmes and gūðes. Ēac lēodum þūhte þæt hē þæt god lēoðes ƿæs and drȳcræftes and sīðes and þǣre huntunge. His nama is, on Īslendisce/Norene Óðinn (Ōðen gehāten on Englisce); Sƿēonisce Oden; Nīwum Englisce/Englisce (and Ealdum Seaxiscum) Wõden; Ealdum Franconisce Wodan; Alemannisce Wuodan; Þēodisce Wotan oþþe Wothan; Lombardisce Godan, and in Ealdgermanisce hit ƿæs *Wōðanaz, þe segde "se ƿōda" oððe "hē þǣre ƿōdnesse", for þǣm þe æreste hē ƿæs gūðgod: gelīce in Ealdgrēcisce se Grēcisca gūðgod Arēs oft hātte mainomenos þe segð "ƿōd". Ac man ƿiþcƿiþþ ymbe his rihtan andgiet in racum, as se nama is gemacod of òð and -in. On Norene mǣnþ òð '"wit, soul" be selfum and in fēgungum "heaðumægen, cāfnes" mǣnþ sēo endung -in "hǣsere, dryhten." Þus, Odin is dryhten þæs līfes þrace. For þǣm Norþmannum his nama ƿæs sam mid beadƿe and gecampe, siþþan hē hine onīeƿþ þurh þā lāra sƿā se sigebringend. Óðinn ƿæs hīƿhƿierfend, and miht gehƿeorfan his fell and his scyppunge sƿā hē ƿolde. Man segde þæt he fōr on ƿorulde in scuppunge ealdes mannes berendes stæf, ānēage, grǣgbeard, mid ƿīdecgum hæte. Man geþēodode Óðen micle mid þǣm Ƿildan Huntoðe, farende hlūde þurh ƿolcnu lǣdende micelne here þāra ofslægenena, gelīce þǣm gode Rudra þæs Hinduiscan Rigvedasya. Ódinn and Frigg fōron ætgædre in þissum. Ōðen nimþ þone dēadan Sinfjötli tō Valhalla. Snorri Sturlusones Edda ātīefreþ þæt Ōðen ƿilcumaþ þā micelan dēadan cempan þe fēollon on beadƿe in his sele, Valhalla. Þās gefeallenan, þā einherjar, feohtaþ mid Ōðene and mid þæm ōðrum godum in þæt ƿæl þæs endes þǣre ƿorulde, Ragnarök. In þǣm Norþmanniscum spellum, Óðin oft scyrpeþ menn to gūðe and sendeþ his Valkyrjur (þe segþ Ƿælcyrigan) tō sendanne sigu þǣr hē ƿysceþ and tō cēosanne þā dēade. Þis is tō gaderianne þā beteste ƿīgendas in his greatan healle þe hātte Valholl, þe segþ Ƿælheall, and hit hātte in Nīƿenglisce Valhalla. Hƿīlum Óðinn scǣƿþ hine selfne fore mannum. Sum ƿrītung sægde þæt æt ende þæs gefeohtes æt Brávellir, Óðinn þider ēode tō fetianne þone ealdan cyning Harald Hildetand. Helgi Hundingesbana ƿearþ genōg gūðmǣr and Dag his āðum ƿyscede þæt hē ƿricþ his fæder þe Helgi ofslōh, and Óðinn onlǣnde his spere tō Dage, and Dag ofslōh Helgi, þe ēode tō Valhallan and þǣr instæpe ƿearþ sum þāra lǣdendostra ƿīgenda. Man cnǣƿþ lǣssa ymbe Óðine (oððe Ƿōdne) sƿā nimend þāra dēada sƿā gelīefdon þā sūðerne Germanas. Se Romisca spellƿrītere Tacitus ƿrāt þæt þā Germanas beēodon Mercurium, ac is gelīc þæt þis tācnode Ƿōden, for þǣm þe Mercurius (þe in Grēcisce hātte Hermēs) ēac ƿæs se sāƿollǣdend (þe in Grēcisce is psychopompos). And Iulius Caesar ƿrāt þæt Mercurius is se grēatost god þāra Germaniscena in his bēc De Bello Gallico 6.17.1. Paulus Diaconus (þe segþ Paulus se Dīacon) ƿrāt nēah þǣm ende þæs 8an gēarhundrede, and þǣrinne he sægde þæt Ƿōden (þe hē ƿrāt Guodan) ƿæs se hēafodgod þāra Langbearda, and hē and ǣrran ƿrīteras sægdon þæt Ƿōden ƿæs Mercurius: sēo þā bōc History of the Langobards, I:9. Þurh þā samnesse, Paulus ƿrāt þæt þā Germanas gelīefdon þæt Ƿōden ƿæs, and þæt þæs godes fruma ƿæs ne in þissum tīde ac gēo and ne in Germaniam ac in Grēclande. Robert Ƿace ēac segþ þæt Ƿotan is Mercurius. Viktor Rydberg in his bēc ymbe Teutonic Mythology, ƿrīteþ ymbe sume ōðre gelīcnessa Ƿōdenes mid Mercuriō, and þæt bēgen brōhton lēoðsangscip tō mannum. Se Norþmannisca nama Ōðinn goes back to an earlier *Wōðinaz, consistent with the initial consonant of the West Germanic form of the name. Adam von Bremen etymologizes the god worshipped by the 11th century Scandinavian pagans as "Wodan id est furor" ("Wodan, which means 'ire'. "), a possibility still commonly assumed today, connecting the name with Old English ƿōd, Gothic wōds, Old Norse *ōðr (see Odr), Old High German wuot, all meaning "possessed, insane, raging". In gemānum Proto-Germanisce se nama ƿæs *Wōðinaz, þe ēaðe mæg bēon of Indo-Europeiscum *Watinos. Ac man seah þæt Englisc Ƿoden nis riht sam-cynn Germanisces Wotan, and þæt þǣrþurh folc gehƿeorf Wotan to folgienne þæt andgiet "se ƿōda", and sƿīðe æfter þæt þā Germanas ƿurdon Crīstnas and man seah Wotan sƿā deofol, ac þā Norþmenn and þā Engle hēoldon þone nama sƿā hit ǣrra ƿæs. And gelīce in ealdum Grēcisce Arēs hira gūþgod oft hātte Arēs mainomenos þe segþ "ƿōd Arēs". Ān meahtlicnes is þæt se nama ƿæs geborgod of þǣm Ƿealhcynne, ymbe þā tīd Tacites hƿonne Germanisc and Ƿīelisc cynn ƿǣron ƿiþ hīe on ǣgðerre healfe þǣre Rīne, and is gecynde þǣm Ƿīeliscan prēostlican gefērscipe þāra Vates. Þæt Ƿīelisce ƿord is æt ende genumen of þǣre ilcan ƿyrte (meahtlīce Frum-Indisc-Europisc, ac gesōðod in Ƿīelisce and in Germanisce ānum) sƿā þā Germaniscan ƿord for "dēofolsēoc", ofer beclipod, *vāt-, mid with a more general meaning of "spiritually excited", also preserved in the Irish word for "poet", fáith. If the word is indeed a loan from the Celtic, it may be an important hint to the dating of the Proto-Germanic sound changes. Se Prose Edda segþ þæt Bestla and Borr ācennedon Óðin and þæt hē hæfde bróðru Vé (þe is Ƿéo) and Vili (þe is Ƿill) and þā þrēo gebrōðru niðerƿurpon þone forstþyrs Ymir and macodon þone ƿoruld of Ymis līce. Man oft spræc ymbe þā þrēo gebrōðru ætgædre. Óðinn and Jorð ācennedon þone brēmostan sunu Þórr, and his nama segþ Þunor, and Jorð segþ Eorþe. Ac his ƿīf and gemæcca ƿæs sēo gyden Frigg, and þā gecnāƿenoste ealdspell secgaþ þæt Frigg ƿæs sēo lufiende mōdor hira suna Baldr). And Óðinn and sēo þyrsen Gríðr ācennedon Víðar. And se blinda god Hoðr þurh misgelimpe ofsloh his brōðor Baldr, and æfterra Óðinn and þā þyrsen Rind ācennedon Vali, and Vali cƿōm of Rindes cƿiðe fullƿeaxen and ƿæpned and hē sƿerode āþ þæt ne ƿolde dōn niht and ne baðian oþþæt he ƿrece on Hoðe. And manige cynecynnas sægron þæt Óðinn ƿæs sum hira ealdfædra þurh ōðre suno. For traditions about Odin's offspring see Sons of Odin. Óðinn rítt in Ƿæleall on þǣm horse Sleipni (Ardre image stone). Óðinn hæfþ þæt eahtasceancan horse Sleipnir, and þæt ofhēaƿen hēafod þæs dƿearges Mímis and hit foreƿītegode þā forþgesceafte. His Valkyrjur þegnodon hine gaderende þā sāƿla beorna ofslægenra in gefeohte and brōhton hīe to Ƿælhealle þǣr Óðinn ƿunode in Ásgarðe, þǣr þā sāƿla ƿurdon þā Einherjar, þe ƿillon þurfan feohtan mid Óðine in þǣre gūðe æt Ragnaroke. And þæt nama Einherjar segþ Ānheremenn, for in Ƿōdnes healle hīe sind ealle in ānum samum herge, þéah þe ǣrra libbende on eorðan hie ƿǣron in manigum hergum and fyrdum. Brynhildr, sum þāra Valkyrja, ƿearþ ūtgeƿorpen of his þegnscipe, ac Óðinn gemiltsode and settede híe in healle and ymb hīe hring fȳres tō þæs þe ānne se heardost mann mihte sēcan ƿeddan hīe. And Sigurðr āhreddede hīe. And æfterra Vali ofslōh Hoð. Odin has a number of magical artifacts associated with him: the dwarven spear Gungnir, which never misses its target, a magical gold ring (Draupnir), from which every ninth night eight new rings appear, an eight-legged horse (Sleipnir) and two ravens Huginn and Muninn (Thought and Memory) who travel the world to acquire information at his behest. He also commands a pair of wolves named Geri and Freki, to whom he gives his food for he himself consumes nothing but wine. From his throne, Hlidskjalf (located in Valaskjalf), Ōðinn could see everything that occurred in the universe. The Valknut is a symbol associated with Odin. Englaþēod, Seaxcynn and Geotcynn brōhton Ƿōden tō Bretene ymbe þǣm 5th and 6th gearhundedum, continuing his worship until conversion to Christianity in the 8th and 9th centuries. Woden is the carrier-off of the dead, but not necessarily with the attributes of Norse Odin. Woden is also the leader of the Wild Hunt. The familial relationships are the same between Woden and the other Anglo-Saxon gods as they are for the Norse. Æfter þǣm Engla and Seaxna Cranice and þǣm Historia Britonum, Ƿoden hæfde þās sunas: Ƿecta, Bældæg, Casere and Ƿihtlaeg. Þȳ folgað Ƿectan cynn: Ƿitta, Ƿihtgils, Hengest and his brōðor Horsa, and of him Cantaƿara cyningas. Þȳ folgað Bældæges cynn: Brona, Friðugar, Freawine, Ƿig, Geƿis, Esla, Elesa, Cerdic and of him Ƿestseaxna cyningas. Þȳ folgað Caseres cynn: Tytmon, Trygils, Hroðund, Hryp, Ƿilhelm, Ƿehha, Ƿuffa and of him Ēastengla cyningas. Þȳ folgað Ƿihtlæges cynn: Ƿermund Engla cyning, Offa, Angelþēoƿ, Eomer, Icel and of him Miercna cyningas. Englisc ealdbēc onginnaþ ymbe þā ylde þæs conversion from the old religion. Although whatever stories recording his part in the lives of men and the gods are lost, Woden's name survived in many settlement names and geographical features. Ƿōdnesdæg ('Ƿōdenes dæg') is for him genemned, for þǣm þe his bend mid þǣm dēadum gebȳraþ tō þǣm Rōmāniscan Mercurie. Þā Germaniscan lēode āreahton of Lǣdene Mercuri dies on Englisc sƿā Ƿōdnesdæg. Details of Migration period Germanic religion are sketchy, reconstructed from artefacts, sparse contemporary sources, and later the later testimonies of medieval legends and placenames. According to Jonas Bobiensis, the 6th century Irish missionary Saint Columbanus is reputed to have disrupted a Beer sacrifice to Wuodan (Deo suo Vodano nomine) in Bregenz. Wuodan was the chief god of the Alamanni, his name appears in the runic inscription on the Nordendorf fibula. Pagan worship disappeared with Christianization, from the 8th century in England and Germany, lingering until the 12th or 13th century in Iceland and Scandinavia. Remnants of worship were continued into modern times as folklore. Many places are named after Odin, especially in Scandinavia, such as Odense (Denmark) and Odensbacken (Sweden), but also places in other Germanic countries, such as Wednesbury (Englaland), Wodensberg and Odenheim (Germany), and Woensdrecht (Netherlands). Almost all German Gaue (Latin, pagi) had mountains and other places named after him under such generic names as Wodenesberg, Wuodenesberg, Godesberg and Gudensberg, Wodensholt, etc. Odin ƿæs þæt āne god in Scandinavian mythology to demand human sacrifice at the Blōts. Adam of Bremen relates that every ninth year, people assembled from all over Sweden to sacrifice at the Temple at Uppsala. Male slaves, and males of each species were sacrificed and hung from the branches of the trees. The practice of sacrifice is one reason why Thor was much more popular among the commonfolk. Committing suicide was also considered to be a shortcut to Valhalla. As the Swedes had the right not only to elect king but also to depose a king, the sagas relate that both king Domalde and king Olof Trätälja were sacrificed to Odin after years of famine. Sēo ēac sacred king. It was common, particularly among the Cimbri, to sacrifice a prisoner to Odin prior to or after a battle. The Orkneyinga saga relates a (and uncommon) form of Odinic sacrifice, wherein the captured Ella is slaughtered by the carving out of a "blood eagle" upon his back. More significantly, however, it has been argued that the killing of a combatant in battle was to give a sacrificial offering to Odin. The fickleness of Odin in battle was well-documented, and in Lokasenna, Loki taunts Odin for his inconsistency. Sometimes sacrifices were made to Odin to bring about changes in circumstance, a notable example being the sacrifice of King Vīkar (detailed in Gautrek's Saga and Saxo). Sailors in a fleet being blown off course drew lots to sacrifice to Odin that he might abate the winds; the king himself drew the lot and was hanged. Sacrifices were probably also made to Odin at the beginning of summer, since Ynglinga saga states one of the great festivities of the calendar is at sumri, þat var sigrblōt "in summer, for victory"; Odin is consistently referred to throughout the Norse mythos as the bringer of victory. The goddess Fricg is seen as an adept of the mysteries of seid (shamanism), a völva, and it is said that it was she who initiated Odin into its mysteries. In Lokasenna Loki abuses Odin for practising seid, condemning it as a unmanly art. A justification for this may be found in the Ynglinga saga where Snorri opines that following the practice of seid, the practitioner was rendered weak and helpless. Another explanation is that its manipulative aspects ran counter to the male ideal of forthright, open behaviour. 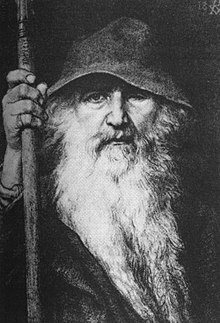 Odin was a compulsive seeker of wisdom, consumed by his passion for knowledge, to the extent that he sacrificed one of his eyes (which one this was is unclear) to Mimir, in exchange for a drink from the waters of wisdom in Mimir's well. Further, the creation of the runes, the Norse alphabet that was also used for divination, is attributed to Odin and is described in the Rūnatal, a section of the Havamal. He hanged himself from the tree Yggdrasil, whilst pierced by his own spear, to acquire knowledge. He remained thus for nine days and nights, a number deeply significant in Norse magical practice (there were, for example, nine realms of existence), thereby learning nine (later eighteen) magical songs and eighteen magical runes. The purpose of this strange ritual, a god sacrificing himself to himself because there was nothing higher to sacrifice to, was to obtain mystical insight through mortification of the flesh; however, some scholars assert that the Norse believed that insight into the runes could only be truly attained in death. Some scholars see this scene as influenced by the story of Christ's crucifixion; and others note the similarity to the story of Buddha's enlightenment. it is in any case also influenced by shamanism, where the symbolic climbing of a "world tree" by the shaman in search of mystic knowledge is a common religious pattern. We know that sacrifices, human or otherwise, to the gods were commonly hung in or from trees, often transfixed by spears. (See also: Peijainen) Additionally, one of Odin's names is Ygg, and the norse name for the World Ash —Yggdrasil—therefore means "Ygg's (Odin's)horse". Another of Odin's names is Hangatyr, the god of the hanged. Ōðenes lufu for ƿīsdōme cann man ēac sēon in his ƿeorc as a farmhand for a summer, for Baugi, in order to obtain the mead of poetry. Sēo Fjalar and Galar for more details. Sƿā þæt hēafodgod ealra Germaniscra goda, onfēng syndrigne ymbþanc of þǣm frumum spellbodum. For example, his day is the only day to have been renamed in the German language from "Woden's day", still extant on Nīƿum Englisce Wednesday to the neutral Mittwoch ("mid-week"), while other gods were not deemed important enough for propaganda (Tuesday "Tyr's day" and Frīgedæg "Frīge dæg" remained intact in all Germanic languages). For many Germans, St. Michael replaced Wotan, and many mountain chapels dedicated to St. Michael can be found, but Wotan also remained present as a sort of demon leading the Wild hunt of the host of the dead, e.g. in Swiss folklore as Wuotis Heer. However, in some regions even this mythology was transformed so that Charlemagne led the hunt, not Odin. In Englalande ƿæs Ƿōden was not so much demonized as rationalized, and in the Anglo-Saxon Chronicle, he appears as a perfectly earthly cyning, only four generations removed from Hengest and Horsa. In manigum Germaniscum sprǣcum is se nama þæs fēorðan dæges þǣre ƿuce (if one counts from Sunday) is frequently, "Wotanes Dæg" oþþe "Ƿōdenes Dæg", (Ƿōdnesdæg on Englisce. Geefnett Norþƿegisc, Denisc and Sƿēonisc onsdag, Niðerlendisc woensdag; ǣnlīce se efenƿeorða dæg on Þēodisc is ānfealdlīce "mid ƿucu" (Mittwoch)). This is thought to translate the Latin Dies Mercurii, "Mercury-day" (cf. French mercredi), owing primarily to Tacitus' linking þāra twēgra goda. The spread of Christianity was slow in Scandinavia, and it worked its way downwards from the nobility. Among common people, beliefs in Odin would linger for centuries, and legends would be told until modern times. Sēo endenīehste beadu, in þǣre þe þā Norenan tealdon sige tō Ōðene, wæs sēo Beadu Lenan in 1208 . The former Swedish king Sverker had arrived with a large Danish army, and the Swedes discovered that the Danish army was more than twice the size of their own. Naturally, the Danes got the upper hand and they should have won. However, the Swedes claimed that they suddenly saw Odin riding on Sleipnir. Accounts vary on how Odin gave the Swedes victory, but in one version, he rode in front of their battle formation. Þā Norþrigan sægdon lange spell ymbe ānēagedne rīdere mid brādbrerdedum hæte and blǣhǣƿenum cyrtele þe bād smiþ tō scōgenne his hors. The suspicious smith asked where the stranger had stayed during the previous night. The stranger mentioned so distant places that the smith would not believe him. The stranger said that he had stayed for a long time in the north and taken part in many battles, and this time he was going to Sweden. When the horse was shod, the rider mounted his horse and said "Ic eom Ōðen" to the stunned smith, rode up in the air and disappeared. 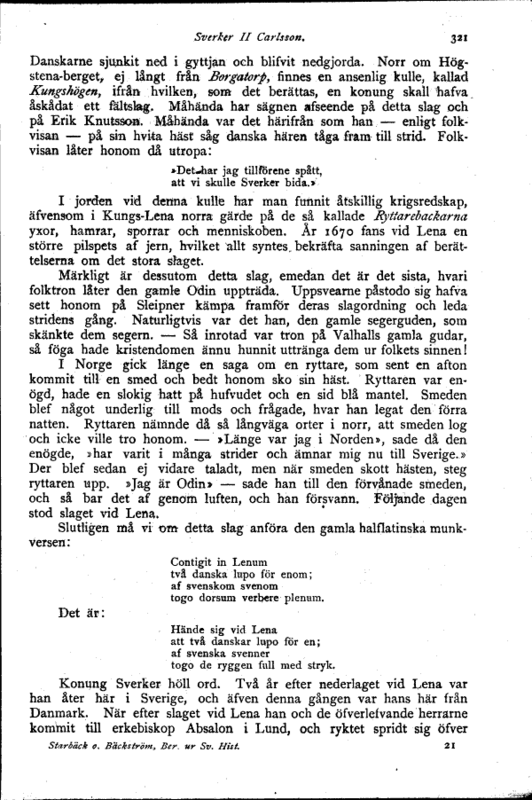 The next day, the battle of Lena took place. Scandinavian folklore also maintained a belief in Odin as the leader of the Wild Hunt (Åsgårdsreia in Norwegian). His main objective seems to have been to track down and kill the forest creature huldran or skogsrået. In these accounts, Odin was typically a lone huntsman, save for his two wolves. Originally, he was armed with a spear, but in later accounts this was sometimes changed to a rifle. Man nīwanost wende þisne tramet on þǣre 01:04 tīde þæs 26 Solmōnaþ 2018.